Motorola has given a pleasant surprise to Indians with Moto E smartphone pricing. In a press event in Delhi, they have announced that Moto E will be priced at Rs. 6999/-, which is good 1000 rupees below than what most were expecting. Motorola have got their pricing strategy absolutely bang-on for all their 3 smartphones; The Moto X, Moto G and now Moto E. All of them are quite attractively priced for the the audience they are targeted at. Like it’s elder siblings, Moto E will also be available exclusively on Flipkart and like Moto G, the sale will start from mid-night (14th May 12:00 am). Bookmark this Flipkart link, if you want to be one of first to get your hands on Moto E.
Like Moto G flew off the shelves in minutes from the time the sale opened up, Moto E is expected to go the same way. We are not too sure on how much stock Flipkart will have. So, if interested, the best chance of buying Moto E will be mid-night today. 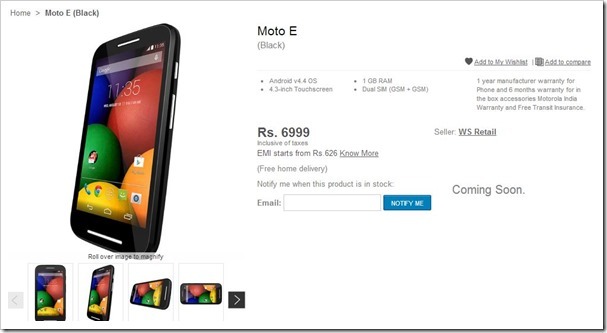 Buy Moto E from Flipkart. Why Moto E will Be a Hit? We think first time smartphone buyers will find Moto E quite attractive. Nokia’s 520/525 have been quite a hit with Indians, and Moto E trumps it in nearly every section including price. The phone is vibrant, has decent specifications and attractive price. All these factors are surely going to drive hoardes of Indians towards this phone. There is another reason why Moto E is an attractive option even, though there are number of android phones with similar (or even better) specs available in this range. It’s the brand name. With Moto X and Moto G, Motorola is proved that they are coming out with quality phones. Indian’s will anytime prefer owning a Motorola over a Micromax or a Lava or a Karbonn! Apart from this, users get to taste the latest and the best Android version: The KitKat. This is the differentiating factor which I think a lot of tech guys (and others as well) will love about Moto E.
In my book Moto E is already a winner! What about you? Moto E White is out of stock already! !